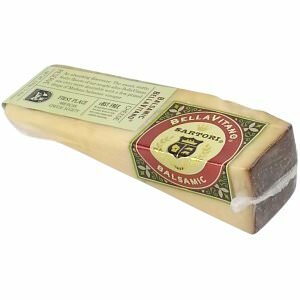 Bathing BellaVitano Gold in balsamic vinegar Sartori's cheesemaker Mike Matucheski has given this gourmet cheese a sweet coating that paid of in a fantastic cheese with multiple awards, among which a first place in the 2010 American Cheese Society Competition. 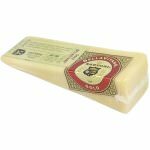 Imagine the sweet, nutty, fruity flavors of a BellaVitano Gold blessed with a few prized drops of Modena balsamic vinegar. Sound delicious doesn't it. 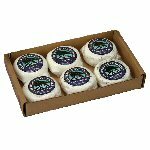 Pair this cheese with Chardonnay, Pinot Noir, Asti Spumanti, Sherry or various beers: Weizen, Weizenbock, Smoked Porters or Pale Ales. 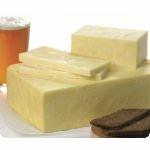 Food pairings seem easy as cheese and balsamic vinegar is already such a great combination; try turkey, chocolate, nuts and great Italian bread. 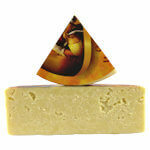 Ingredients: Bellavitano cheese (pasteurized milk, cheese culture, salt, enzymes), balsamic vinegar.